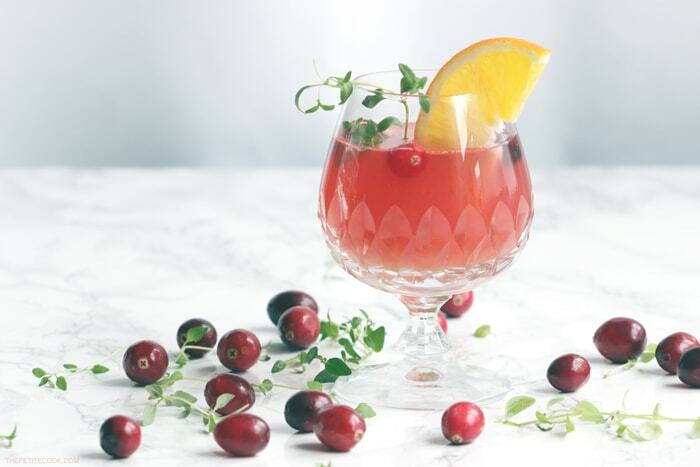 Cranberry juice adds a festive—and healthy—splash of red to your holiday cocktails. Mix it with some vodka and fresh orange juice for a refreshing drink to entertain your guests. This sophisticated cocktail with a crisp cranberry kick is always my first choice of drink to serve at holiday parties. Not only is it delicious, but leaves a nicely refreshing taste in your mouth and it’s not too alcoholic. 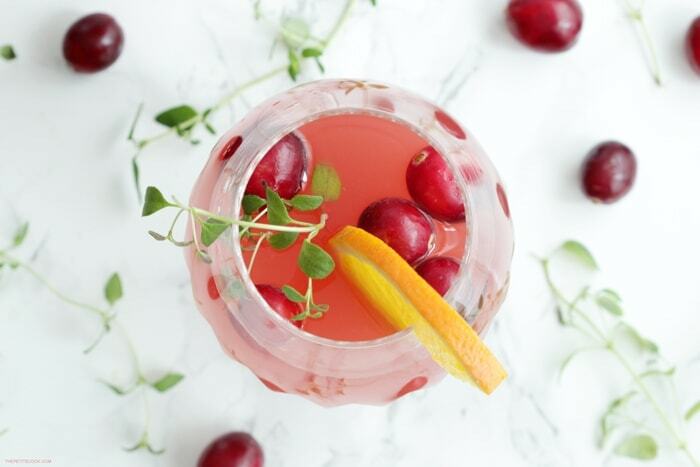 Seasonal fresh orange and cranberry juice, vodka, a splash of lime and a sprig of thyme, all come together to make this vibrant boozy beverage. 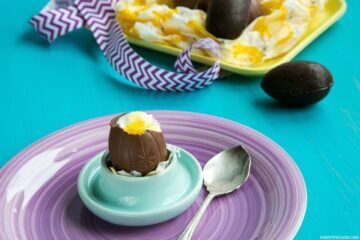 It’s sweet, slightly on the tart side, and goes down a lot easier than I’d wish it to. To make this festive cocktail, I’ve teamed up with the world-famous Italian design brand, Alessi. I’ve been obsessed with Alessi for ages, and I’ve managed to build up a nice collection of their products during my cooking years. When making drinks, one of my favourite items to use is hands down the Juicy Salif. It’s absolutely stunning, easy to use and very practical. I loved it even more after discovering the fascinating story behind it. 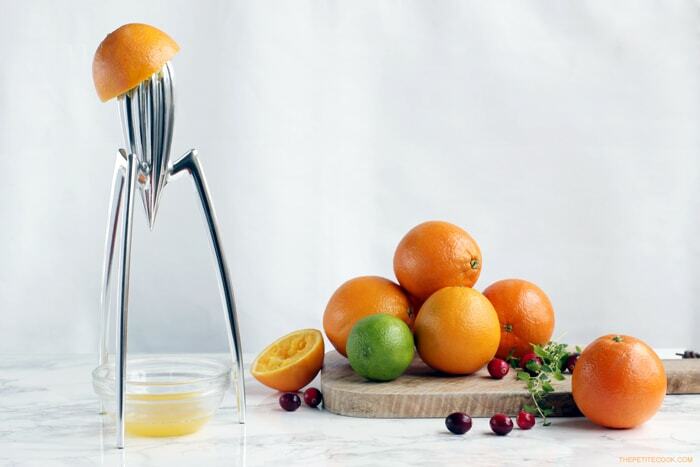 Far from being just a pretty squeezer, the Juicy Salif was designed by French designer, Philippe Starck back in the 90’s. While he was having lunch on holiday on the Island of Capraia, Italy, Starck was squeezing a lemon over his plate of squid when the shape of the mollusk inspired him to create the Juicy Salif. 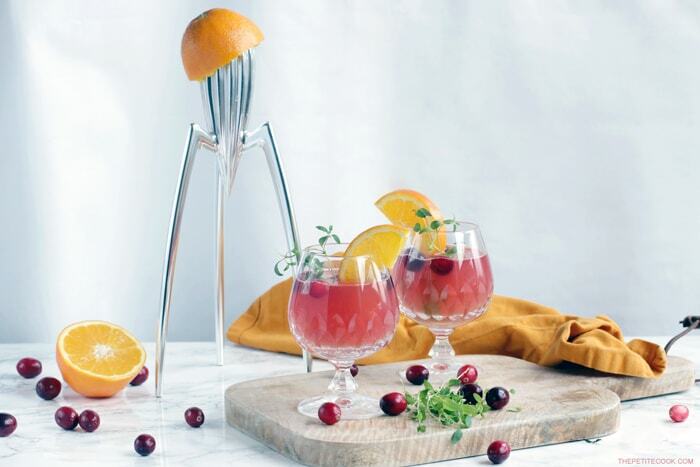 The Juicy Salif is a handy companion in the kitchen, making my cranberry and orange vodka cocktail a total breeze. Freshly squeezed oranges are simply mixed with cranberry juice, vodka, lime and a sprig of thyme in an ice-filled shaker. All you have to do is shake! shake! shake! Like crazy for a handful of seconds and your holiday drink will be all ready to sip. I was super thrilled when Alessi asked me to enter their #ALESSIMOMENT competition, as I knew I just had the perfect shot with one of their iconic designs to share.? Good news! You can also join the competition for a chance to win some amazing gifts: The first prize is a holiday in Tuscany (including wine tasting, a Vespa tour and cooking lessons), the second prize is an electric bike by Ducati and the third prize is an Alessi watch. The competition runs during the festive period (from 1st November 2015 until the end of January 2016) in 45 retailers across the UK. When you visit the store, you will receive a promotional card to be used on the website to enter the competition. All you have to do is snap a picture of your favourite Alessi product and use the hashtag #ALESSIMOMENT on your social media channels. A panel of prestigious judges will then choose the best photographs.? And while you’re on it, check out Alessi’s Facebook & Instagram pages for more holiday inspiration. 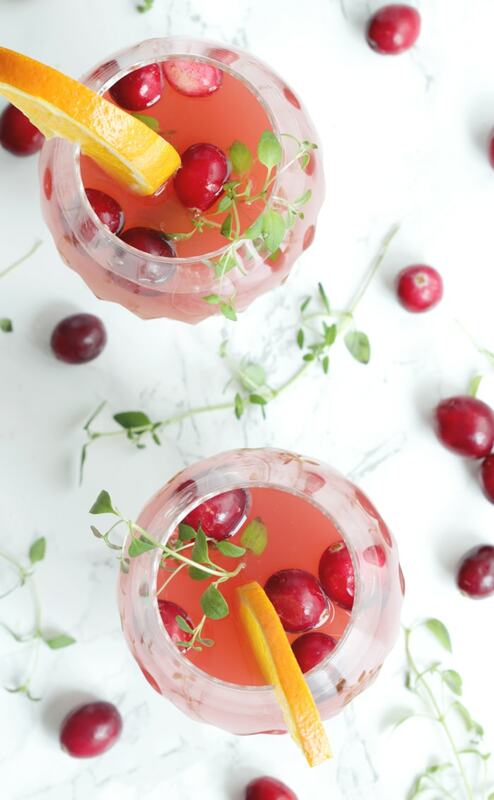 This cranberry and orange vodka cocktail is the perfect holiday drink to share with friends and family at your next party!? I really hope you’ll give this delicious cocktail a go during the holidays. If you do, please leave a comment below and let me know how you liked it! 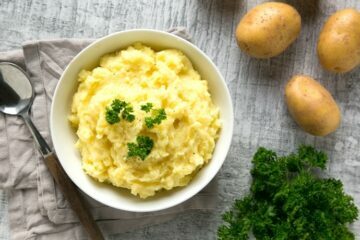 Or even better, take a picture, tag it #thepetitecook and share it on Instagram! 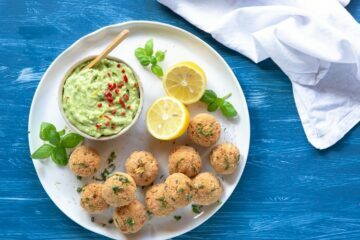 Looking at your yummy creations always makes my day! 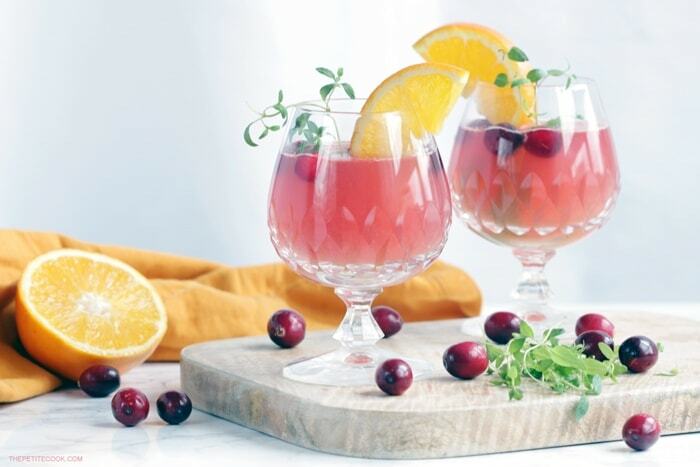 This cranberry and orange vodka cocktail is the perfect holiday drink to share with friends and family at your next party! Squeeze the juice from two oranges. Add vodka, cranberry and orange juice, thyme and lime zest in a large shaker filled with ice. Shake vigorously for 20 seconds, then divide the cocktail in two serving glasses. Decorate with fresh cranberries, thyme and orange slices, and serve. Note: This post is sponsored by Alessi. All opinions are my own as always, and yes, I’m totally and absolutely obsessed with Alessi. 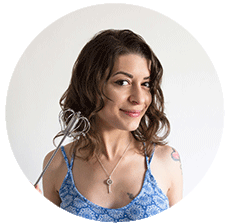 Thank you for supporting the brands that support The Petite Cook!